I really did consider my decision to go out to Lake Pleasant when the forecast was for 103 degress but the oppurtunity to sail on one of the new fleet of J80’s that have recently arrived in AZ was too tempting. We rigged Mike Ferring’s new boat at the marina and motored out to a flat and calm lake. We bobbed around for close to an hour but then the breeze filled in nicely and we had some great sailing. Things got even better when Chris Smith (see photo) joined us for the maiden voyage in his similar boat and we did a little speed testing together. The breeze remained strong all day and we even saw some whitecaps for a while. It was hot but a lot of fun. Congrats to Mike Ferring, Chris Smith and Peter Hartleb on their new boats. 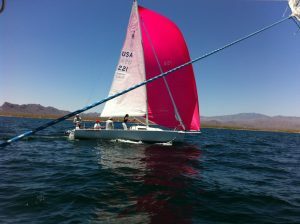 Leaving the lake, the only remaining question I had was whether the spinnaker was HOT PINK or what. Ask Chris what color it is next time you see him. June is for Fun – AYC Family Night!